It's sweet, spicy, saucy, meaty and it fills the house with the smell of Yuntif. Enjoy this "fix-it-and-forget-it" recipe for brisket this Rosh Hashanah and year round. Place chopped vegetables in at least a 2-inch deep pan or cooking tin. Generously salt and pepper the meat on both sides. Sprinkle generously with paprika and granulated garlic and place meat on top of the vegetables. Pour olive oil on top and rub in slightly to form a dark crust over all over the meat (this will get messy). Wash hands and drizzle meat and vegetables with honey. Add beef stock or broth to pan without upsetting the spices on top of the meat. Cover tightly with foil. Place in a 375 degree oven for three hours. Remove and slice meat 1/3 inch thick, against the grain. Taste and add salt or honey as necessary. If meat needs further cooking (i.e., if it is not fork tender,) place back in jus and continue cooking for an additional hour. 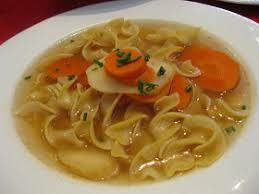 Store sliced meat in its jus whenever possible, and reheat entire dish together with vegetables. If you have time, remove jus from the dish and reduce in a pot on the stove for 10-15 minutes. The flavor will deepen and you can add salt, pepper or honey as necessary. Serve hot. The jus is particularly good with the cooked veggies and mashed potatoes. Was looking for a recipe for this type of meat so it's really cool I bumped on to your blog. Any tips to tenderize the meat as much as possible without spoiling the taste? 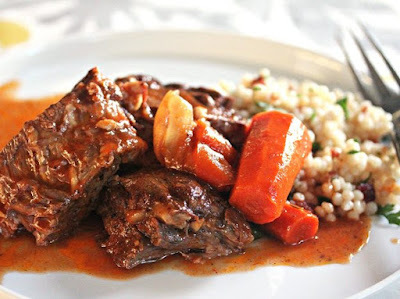 The cooking time of three hours will tenderize the meat quite well without adding any additional tenderizers such as wine, as will the process of braising (roasting with liquid in the pan). Make sure to cover the pan tightly and completely so as to retain the moisture, which is key to a tender brisket. The acid in the onions also help with the tenderization process so I often place sliced onions on top of the brisket as well as below. If it is still not tender enough for you when you slice it, place the sliced pieces back in the jus and into the oven for an additional hour at a reduced heat, approx. 325 degrees.